The therapeutic aroma candle represents the very essence of aroma candles because of the beneficial effects it gives to anyone who smells its scents. For this aroma candle, we will use lavender, a popular herbal aroma. The following materials can make one big colorful therapeutic aroma candle. 1. Melt a small amount of wax. 2. Dip the wick in melted wax. Place the wick on one end of the wick sustainer. Set aside. 3. Put some pellets in a small basin. 4. Drop lavender essential oils in the pellets. The quantity of lavender oils will depend on the desired strength for the aroma candle being made. Mix well. 5. Transfer into 6 plastic cups (the pellets with aroma oil). 6. Put coloring or dye wax by using a chopstick until color is blended into the pellets. 7. Place the dyed or colored pellets into a glass container. You can use any desired shape or form and combine colors according to your taste. 8. Make the nylon wick stand in the center of the glass container. Position the wick up to the bottom of the container. 9. Melt gel wax inside the kettle. Remove from fire until it starts to cool. 10. Pour the gel wax on top of the pellets. This will serve as the protection of the pellets. 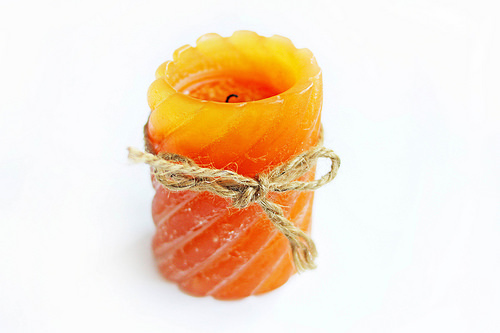 We have completed the steps in making therapeutic aroma candle. This is best used in bedrooms, because of its soothing and relaxing effects to the body. It is estimated that the 120 pieces of therapeutic aroma candle can be made in one day which became the basis for the computation of the unit cost and selling price.